This is a traditional Maharashtrian snack made from rice flour. 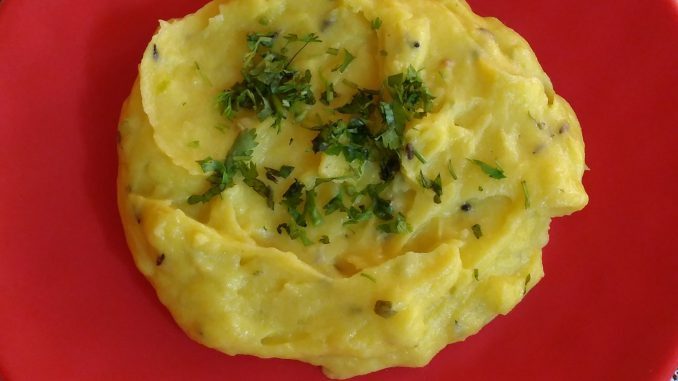 It uses very few ingredients and is easy to cook and very tasty snack. Tandhul is Rice and Ukad is something that is Steamed. 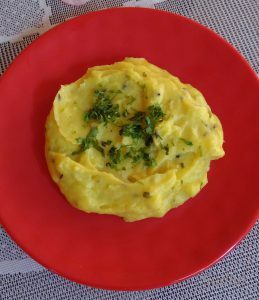 Since this recipe uses Buttermilk (Tak in Marathi), it is also called Takatali Ukad. There are similar dishes in other parts of India – Gujrat and Tamilnadu / Kerala. Process may be little different but all are tasty. 1. In a bowl mix rice flour and buttermilk. Add salt and mix well to ensure there are no lumps. Consistency should be like Bhajia / Pan Cake batter. If required add water to batter. 3. In a pan, heat oil. Add mustard seeds; Wait till splutter. Add Cumin Seeds; wait till splutter. Add Turmeric Powder, Asafoetida (Hing) and Green Chilly Paste. 4. If you decide to add ginger and garlic, add it now. 5. Pour the batter in the pan. 6. Cook on low flame stirring all the time, till mixture thickens (about 2 minutes). 7. Add ½ cup water, keep stirring. 8. Repeat steps 7 and 8, three to four times. Stop this when the mixture does not thicken further. 9. Cover the pan with lid and cook the batter. 10. Keep stirring every 2-3 minutes. 11. Cooked batter will have a nice glaze. 14. Ukad tastes awesome if you add ½ spoon of oil while eating. As per nutritionists, eating raw filtered oil is good for health; so enjoy Ukad with oil.